Last week I attended the annual Canadian Farm Writers Federation (CFWF) conference in my old stomping ground of Winnipeg. Friday was tour day. Unfortunately, the weather did not cooperate. There was a chill in the air with a strong wind and periods of rain. But what can you expect? It’s Manitoba! We bundled up and survived. My tour ventured north of Winnipeg into the Interlake region (the area between Lake Winnipeg and Lake Manitoba). We made several stops before heading to the community of Warren for a delicious made-in-Manitoba dinner and entertainment. Our first stop was Netley-Libau Marsh. At 250 square kilometres, this is one of the largest freshwater coastal wetlands in North America. Netley-Libau is the last line of defence against excessive nutrient loading to Lake Winnipeg, with the potential to absorb large amounts of nitrogen and phosphorus. Many of you will have heard of Lake Winnipeg – perhaps from the 2011 David Suzuki documentary called Save My Lake. Lake Winnipeg is the 10th largest freshwater lake in the world and is integrated into Manitoba’s economy, recreation and culture. Excessive amounts of nutrients such as phosphorus flow into the lake from its surrounding watershed. Human activities are largely to blame. As a result the lake is afflicted by blue-green algal blooms that deprive it of oxygen. In 2006 the University of Manitoba and Ducks Unlimited Canada collaborated on a research study at Netley-Libau Marsh with the goal of reducing nutrient loading to Lake Winnipeg. 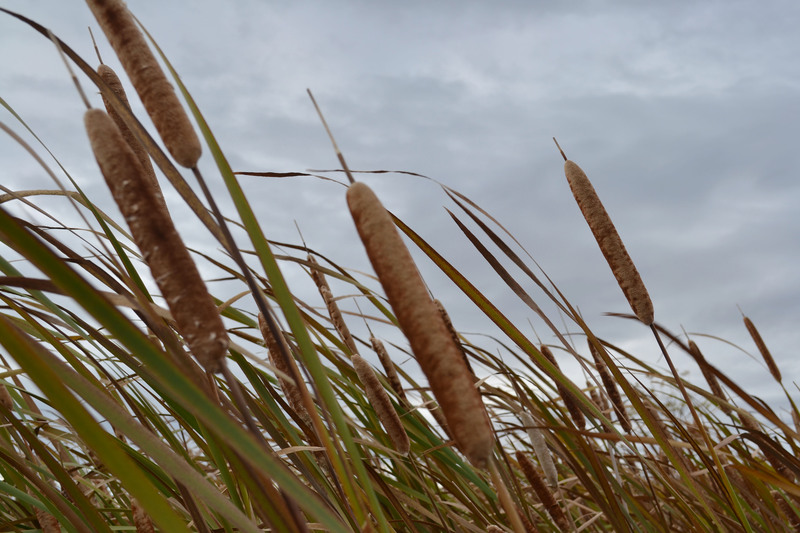 The Netley-Libau Nutrient Bioenergy Project documents the ability of a marsh plant known as cattail to intercept and store nutrients. 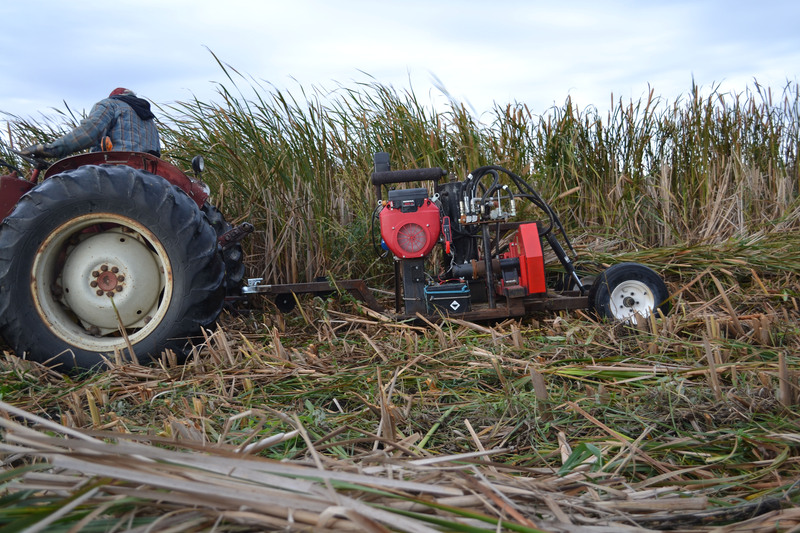 The cattail is then harvested and turned into biomass for bioenergy. This is not only a novel energy source but also a way to prevent these nutrients from entering Lake Winnipeg. This project demonstrates that reducing nutrient loads to Lake Winnipeg can be profitable and contribute new value streams to the provincial economy. 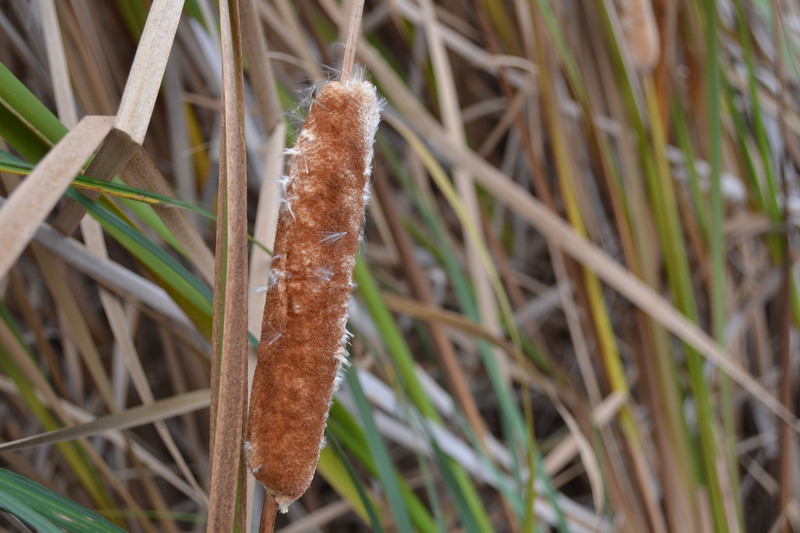 Here are some photos from the cattail harvest. Cattail blowing in the breeze. Harvesting cattail. 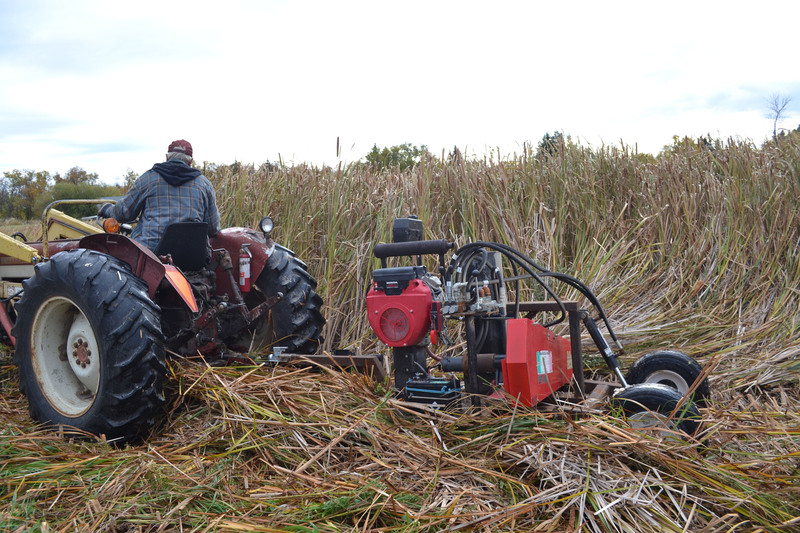 This machine, pulled behind a tractor, is used to cut down the cattail. It dries in swaths and is then baled. 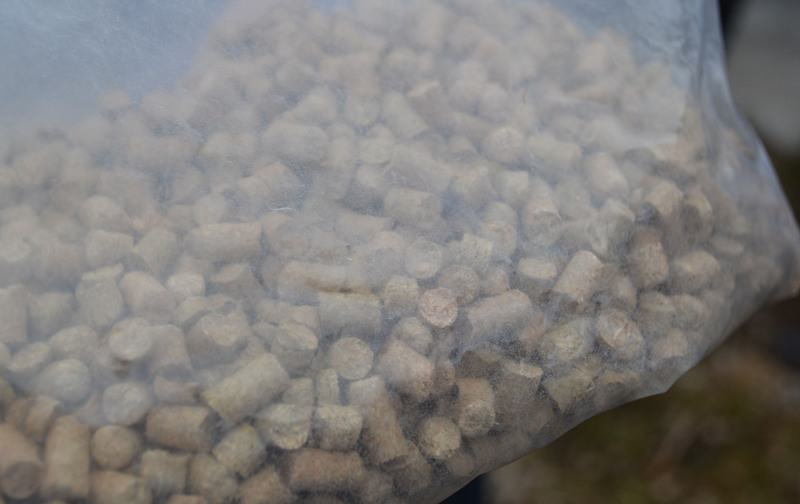 Harvested cattails can be compressed into various fuel types such as pellets, cubes and logs. 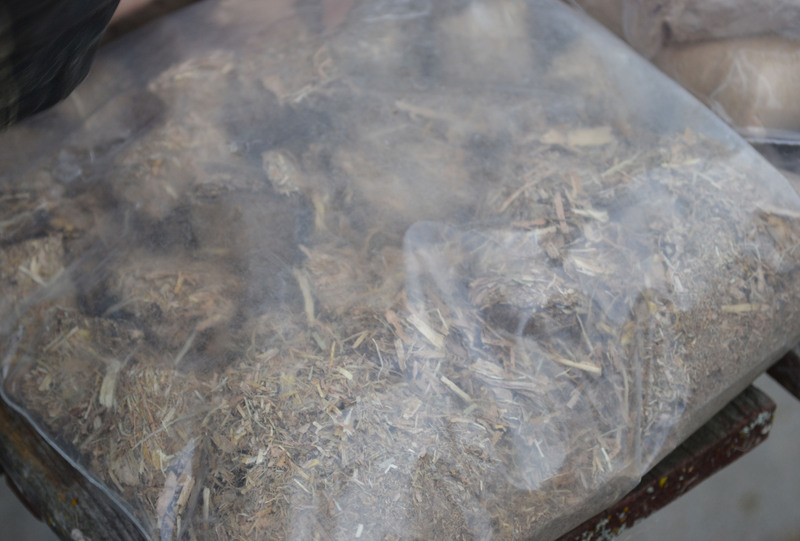 The cattail fuel can be burned to produce heat energy. Next we visited Oak Hammock Marsh, one of North America’s most important wetland interpretative centres. We also stopped at a grain farm in the area where we learned about growing winter wheat and other crops. And finally we dropped by the Watersong Trout Farm/Riddell’s Roasters, a fish and chicken farm. I first visited this farm last summer where I learned about the Manitoba-Canadian Model Aqua-Farm Initiative. To learn more read this blog post. I’ve never thought of the topic, farming writers (found you on WordPress.com’s “explore topics”). I’m passionate about the Farming God’s Way model of farming. In 2009 I trained a chief in Kanyama, Mwinilunga District, Zambia, and 36 of his villagers. Their harvests have since doubled (i.e. each of the 36 farmers and the chief’s harvests have doubled). As a farm writer you may be interested to go on to the http://www.farming-gods-way.org website (not my site) and check out the testimonies? It may be something you’d like to write about? I’m sure there must be some farmers in the States using this model. What a great way to use resources that are just sitting there. I love to see people being creative outside the box.